As I’ve never experienced the splendour of seeing Newcastle United win a trophy, the happiest Saturday of my life occurred on the 26th August 1995, when “The best looking lass on The Fell” became my wife and therefore forever known as “The Breadknife” To celebrate the 18th anniversary of this joyful event I treated her to a night away in the beautiful city of Chester and to make this trip that little bit more special, she witnessed her very first groundhop, as we took in the Sunday leg of the Welsh Alliance festival organised by Groundhop UK. We made an early start, leaving home at 730am, with the traffic on the A1 and M62 quiet enough to see us arrive at our first destination by ten to eleven. 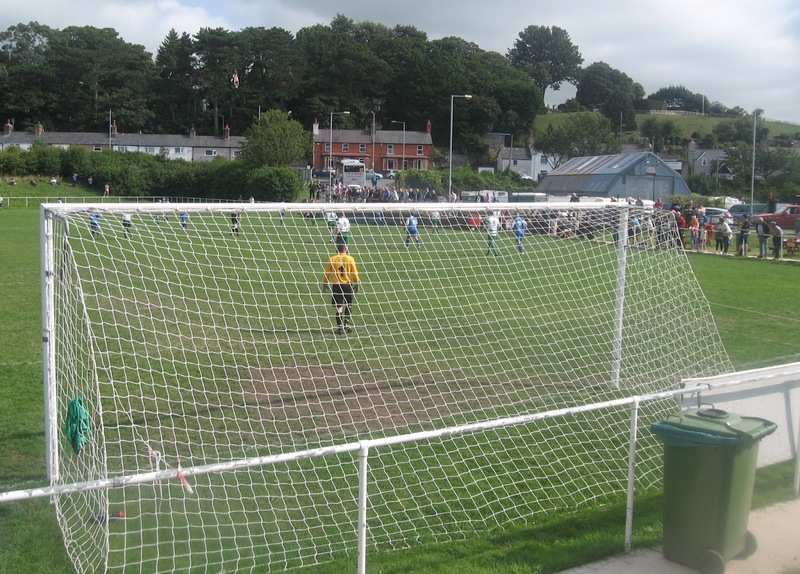 The three matches took place within the Conwy County Borough (Welsh: Bwrdeistref Sirol Conwy) in north Wales. The unitary authority area contains the major settlements of Llandudno, Llandudno Junction, Llanrwst, Betws-y-Coed, Conwy, Colwyn Bay, Abergele, Penmaenmawr and Llanfairfechan. There’s a total population of around 110,000 living along the north coast and I imagine about half these residents are Scouse exiles! The River Conwy flows through the county rising in Snowdonia and through Llanrwst and Trefriw en route to the Irish Sea by Conwy, where the river marks the border between the neighbouring counties of Caernarfonshire and Denbighshire. We arrived a good hour before the match, after accidentally finding a good parking spot across the road next to Morrisons. 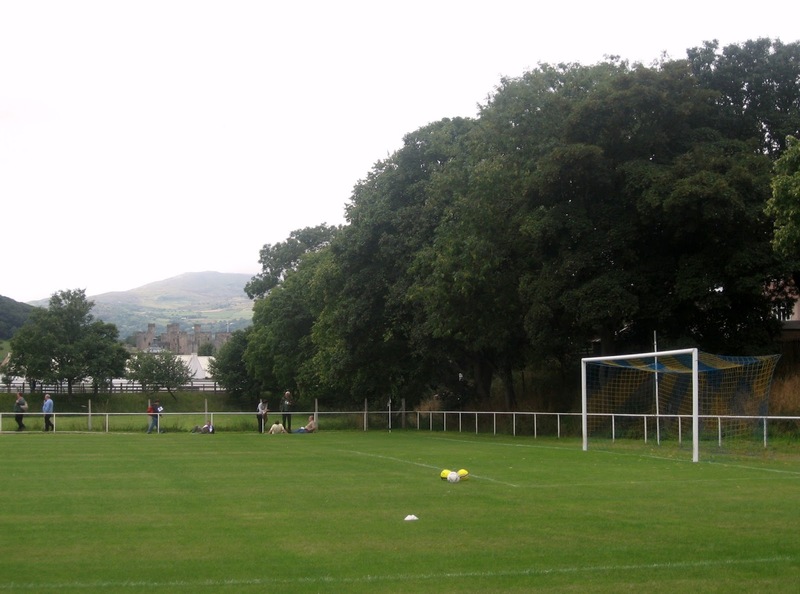 The Flyover ground is found on the main Conwy Road, access gained past a kiddies park which leads to the main entrance. Here you’ll find the club office, changing rooms and the refreshment bar called ‘Horrible Hayden’s Café’ which served a lovely bacon sarnie which we both gleefully devoured after our long road trip. There’s also a unisex toilet which had a constant queue outside, due to there being only one pot to piss in. 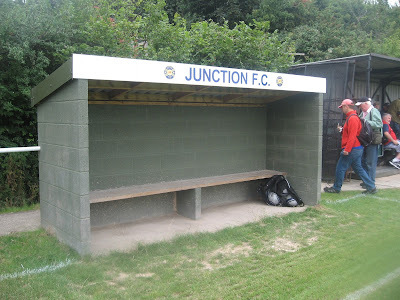 Along one side there’s a small meccanno type stand with about 50 seats in between the dugouts which are clearly marked as JUNCTION FC and AWAY. 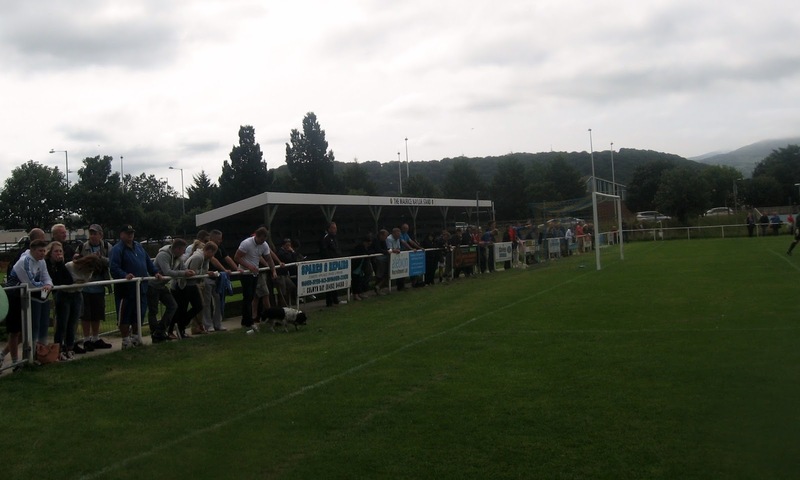 Behind the nearside goal there’s a covered section at one side of the post called The Maurice Naylor Stand’ with the rest of the ground open with hard standing behind the perimeter fence. There have been a couple of clubs playing under the name of Llandudno Junction. The original club played between 1910 and 1927, with a second LJFC appearing in 1937 in the Vale of Conwy League. 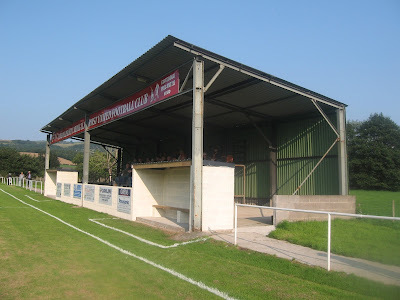 In 1954 they merged with Conwy becoming Borough United. 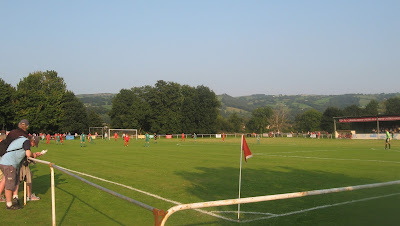 The current club was founded as a Sunday team under the name of Hotpoint FC in 1975, before becoming Llanfairfechan Athletic when they moved to Llanfairfechan’s Recreation Ground during the 1996–97 season. 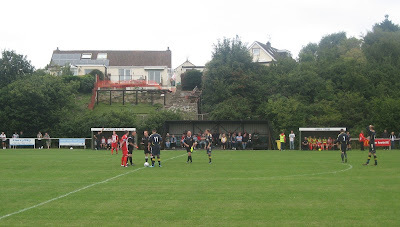 In 1998, the club returned to the town to their current ground at The Flyover, which had previously been the home of Crosville. 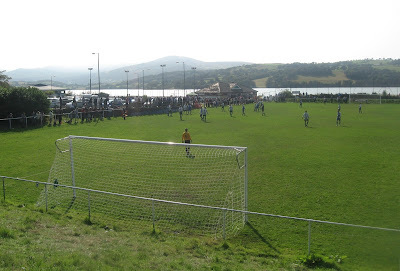 The Railwaymen became Llandudno Junction FC again at the start of the 1999–2000 season. The club are very much a community club with a large junior section with a new adjacent pitch developed during the summer. Unfortunately our hosts for today’s first game suffered a heavy defeat to Holywell Town, as the visitors went nap, taking the lead in the 25th minute with a powerful header from Tom McElmeel before Graeme Williams slid in to double the lead just before the half time whistle. The players and linesmen entered the pitch for the second half but the match was unable to start because the main man was missing. The little ginger referee finally emerged from the dressing room, having taking his full allotted fifteen minutes. Again, just as he was at the start of the game, he was flanked by two stewards, standing next to him like bodyguards to avert an immediate attack from players, fans or maybe both. I’d love to know the history of Mr Arwel Jones because he seems a bit of a character and seems to have the impression he’s some sort of VIP. Holywell continued where they left off in the first period, adding a third from Sam Jones on 54 minutes before his namesake Jamie rifled the ball high into the net on 79 after ‘keeper Hughes had pulled off a terrific save. 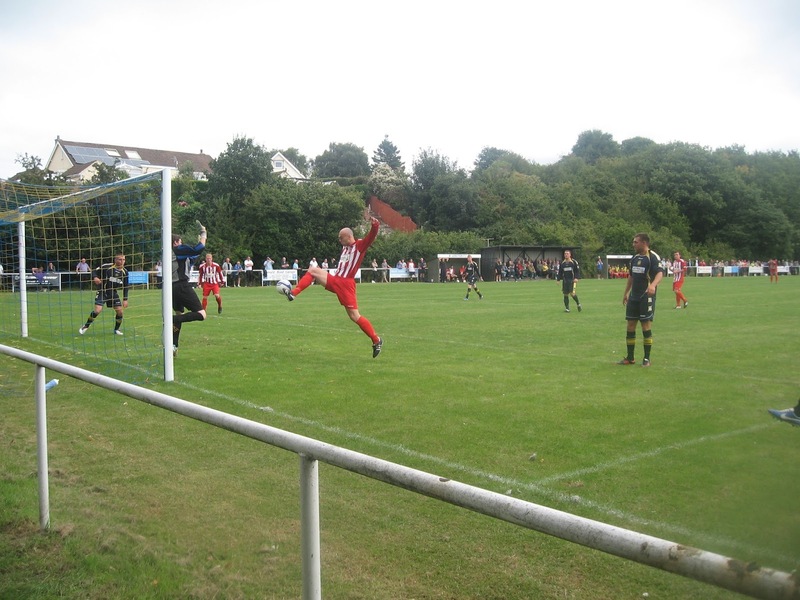 The scoring was completed from the spot with Paul David Williams making up for his penalty miss twenty minutes earlier to make to final score 5-0 to the Wellmen. So that was the Llandudno Junction done, a friendly welcome, lovely bacon butty, a pedantic referee and the only downside being we didn’t win the raffle where the prize was a big case of ale. It isn’t possible that everything goes exactly to plan, there’s always some kind of hick-up somewhere along the line. As we returned to the car we noticed four gentlemen getting into the car in front of us, so to save setting the sat-nav we followed them to our next destination. 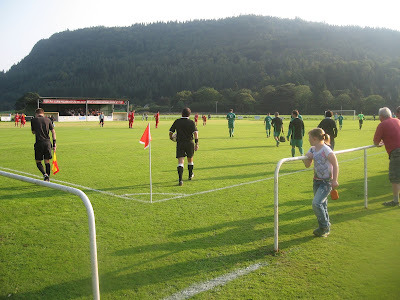 It wasn’t until we were travelled along the A55 towards Colwyn Bay that I realised they weren’t groundhoppers at all. I should have know really, as I would have expected to see at least one of them sporting a scruffy beard or heavy laden with a haversack on their back. 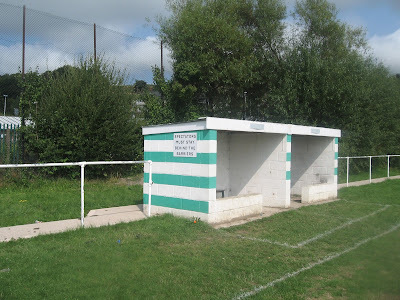 Nevermind, I just had to give our sat-nav Margaret the info and she’ll lead us to the next game, however the postcode I jotted down from the Non-League Matters forum took us to another Llanrwst Road, a residential area in the middle of nowhere. To cut a long story short we ended up returning to the Llandudno Junction ground and asking for directions for the five minute journey which all together had taking us 40 minutes. After playing in various grounds around the county, Glan Conwy opening their present home at Cae Ffwt in 1998. The ground is found within a lovely setting with views of the River Conwy and the castle on the other side of the water. The club set up a gazebo at the entrance, next to the newly refurbished pavilion which houses the changing rooms and refreshment area. 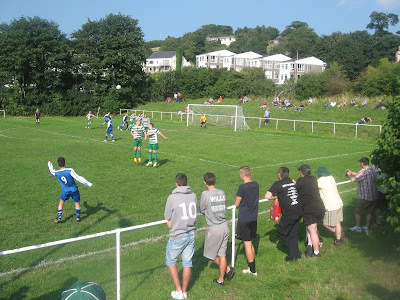 The ground is open with some good viewpoints on three sides, especially at the far goal where from the bank there’s splendid views of the river , castle and surrounding hills(see Web album) The team dugouts are on the opposite side, painted in the club colours of green and white horizontal stripes. 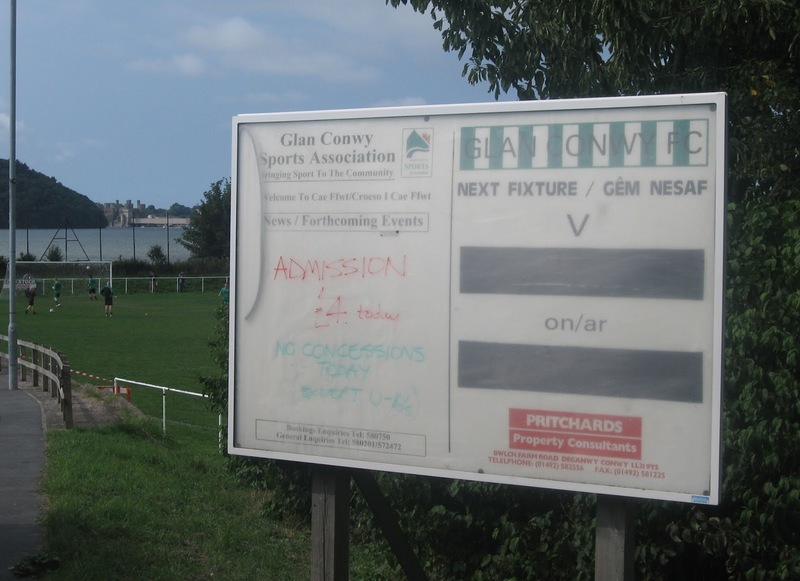 Glan Conwy formed and became one of the seven founder members of the Vale of Conwy League in 1922. The club nickname was the “Jolly Boys” and they played at the former Gala Field up until the outbreak of World War II. The club re-emerged in 1979 returning to the same league the following year. 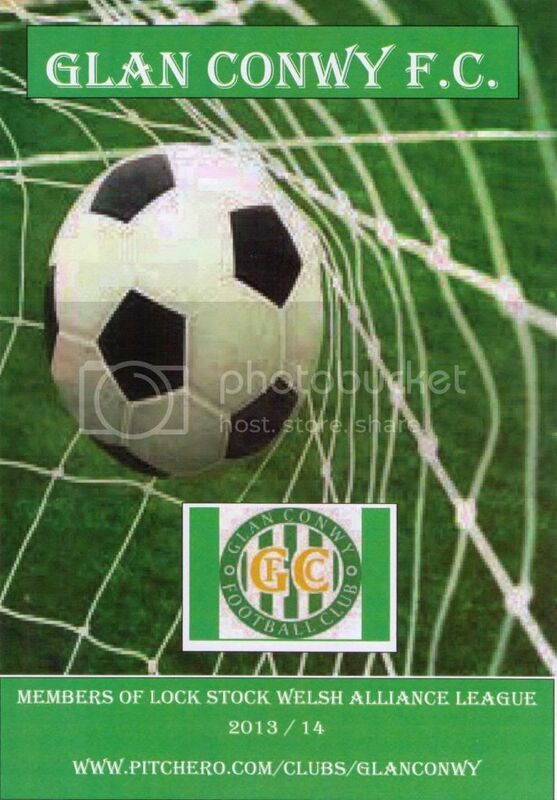 Glan Conwy went on to win the title in 1998 and promotion to the Gwynedd League, which they also won in their debut season. They have stayed in the Welsh Alliance League ever since, twice finishing league runners-up and have won the FAW Trophy in 2010. This game was a more competitive affair which could have gone either way in an exciting second half. Nefyn United took a fortunate lead when a 30 yard free kick from Carl Jones wide on the right, beat everyone as it sailed over the keeper before nestling in the net with only five minutes gone. The hosts equalised early in the second half when Mereck Knight got on the end of a low cross from the right to fire home from close range. Both teams went all out for the winner as they carved out some decent chances as well as a few niggling tackles coming into play, but overall a draw was the fair result with I suspect both teams were satisfied with a point. 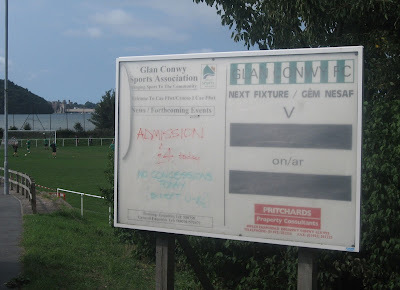 Glan Conwy was our favourite out of the three clubs visited. On arrival we had some of the local bevvy, made available from the Great Orme Brewery. Debra had a bottle of Orme while I necked the Welsh Black which were both very nice. The club officials were very friendly, especially the canny bloke with the grey hair and tache who told us he has kept up the long standing family tradition of being a Newcastle supporter. We also enjoyed the tea and cake and lets not forget the man on the PA, who in his other life most be a frustrated comedian or judging by the way he read out the result of the half-time raffle, a bingo caller at the local Mecca. 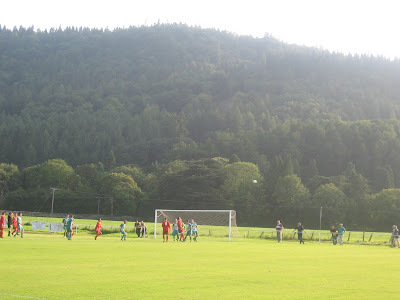 The final game of the day was 11 miles south down the A470 to Llanrwst. 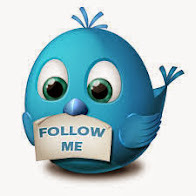 The small community town takes its name from the 5th- to 6th-century Saint Grwst. As we arrived in the town we suddenly came to a halt, with bumper-to-bumper traffic on both sides of the road. It was only when the sight of the bridge came into view that the problem became apparent. The narrow three-arch stone bridge, Pont Fawr is the town’s main feature and was built in 1636 by Sir John Wynn of Gwydir Castle. 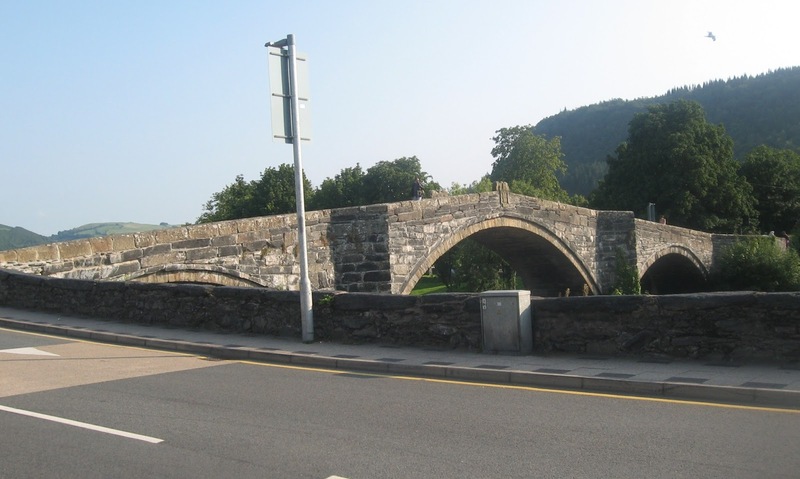 The bridge connects the town with Gwydir, a manor house dating from 1492, the 15th-century courthouse known as Tu Hwnt i'r Bont and also the road from nearby Trefriw, plus of course Gwydir Park the home of Llanrwst United. The unbelievable thing about the bridge is it’s still has the same concept as when it was originally built in the 17th century. There’s only room for one vehicle, so as you drive up towards its high peak your unaware of any oncoming traffic until its too late, which results in a face off and a battle of wits in who will give in and reverse back first. It’s as if traffic lights are yet to be invented. We managed to get across in one go, but made note to avoid the bridge after the game and make enquiries about an alternative route back north. After parking at the ground we walked back across and had a drink in the Eagle Hotel where they served the local nectar Nant ‘Rwster’ (4.6%) which I enjoyed as we watched the kafuffles on the bridge. 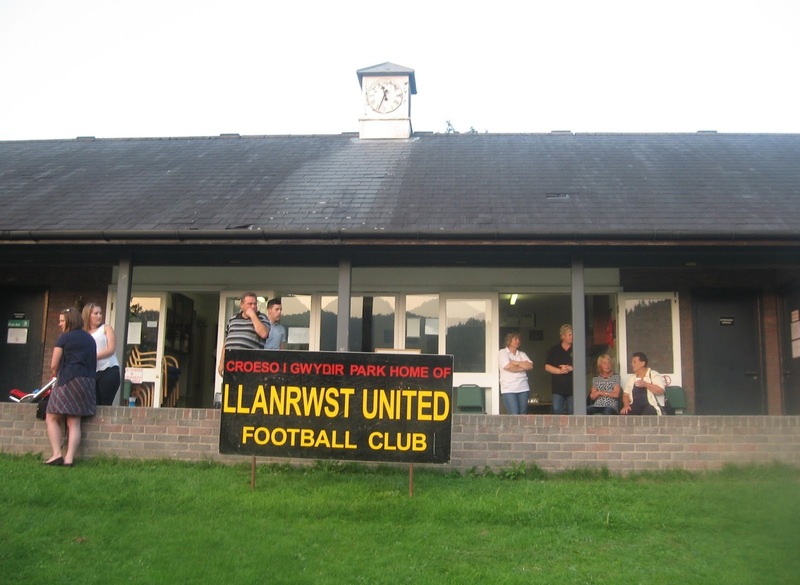 Llanrwst United where formed in 1984 after the marriage of the towns two clubs; Llanrwst Town and Llanrwst Athletic and they’ll celebrate their 30th anniversary at the end of the season. 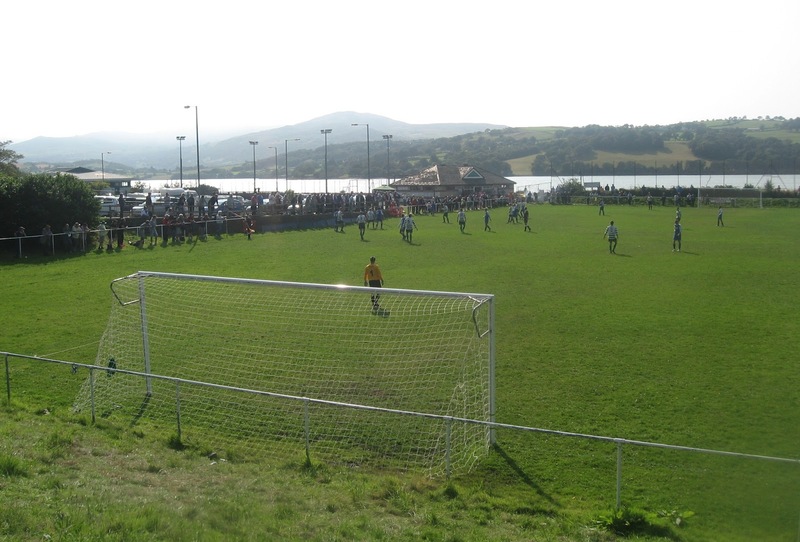 The club won the Vale of Conwy League in 2003-04 and have added a variety of cup honours, including being the current holders of the Mawddach Challenge Cup. 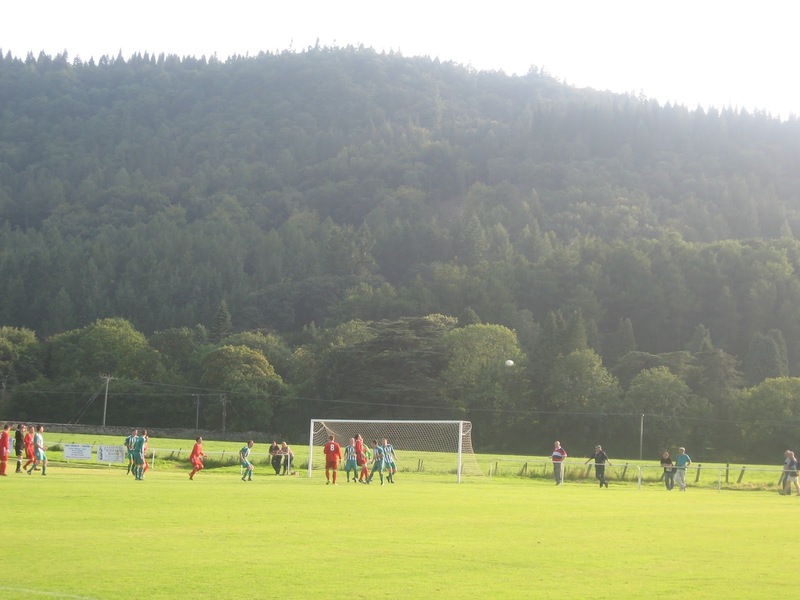 Gwydir Park has a fantastic backdrop which is open to the elements on three sides. The ground is also used as a cricket ground so there’s a walk around the outer boundaries to the paying entrance. The pavilion which houses the clubhouse and changing rooms is at the top of the pitch and for this occasion there were a couple of gazebos set up as a bar area at the front of the building. The Phil Smith Stand is at the far side, which has three rows of seats in grey and orange. The seats are raised on a platform which looks over the brick wall which connects the dugouts. 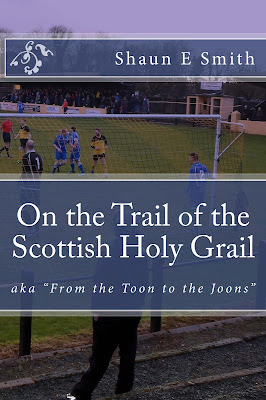 The match against Bodedern Athletic turned out to be a damp squib, with plenty of huff and puff but very little quality, with too many passes and shots on goal going astray, which was a crime considering the match was played on a divot-less carpet of a pitch. Having said that the match didn’t spoil an enjoyable visit to another hospitable club. 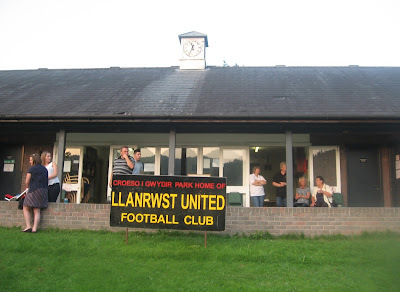 I seemed to have spend a fortune across the day with admission for the both of us, programmes, pin badges, raffle tickets, food & drink and at this ground I managed to fork out an extra quid to purchase a Llanrwst United black and white shirt. The lad on the stall picking out the no.9 shirt especially, which may have been old and tatty, but it’s a canny souvenir and at least it doesn’t have the word Wonga written across it. Afterwards we headed off to Chester, where we had a night out on the lash which included two new ‘Spoon ticks, then spent the morning walking along the banks of the River Dee and the city walls like a young courting couple as we celebrated our 18th wedding anniversary. 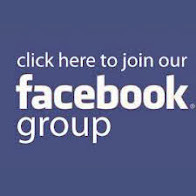 We had a cracking day and it was good to meet up with Laurence R, Peter T, John Mc, Graeme H, The Groundhog, as well as meeting Peter Ford and Paul Brockett for the first time, plus everyone who gave me a nod and a wink, admiring my Half Man Half Biscuit t-shirt. 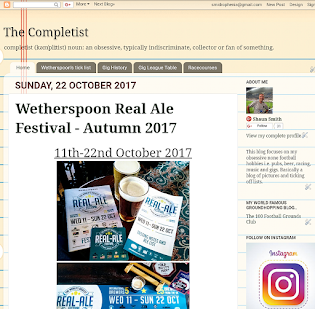 Special mention of course to Chris and Laurence, who seemed to have played a blinder over the weekend and finally I can report that the breadknife really enjoyed her first groundhop, so overall a very happy anniversary for the both of us. Weren't you at SJP for the presentation of the 2006/7 Intertoto Cup? I was, but you won't be surprised to hear I don't count it.